Secil AdhereVit mortar is a white, fibre reinforced, fixing and levelling mortar. It is used with the SecilVit Cork Board systems and other carrier boards in new construction and refurbishment works. Made with Secil natural hydraulic lime binder and cork aggregate, Secil AdhereVit also contains a small amount of cement to guarantee good adhesion. It is available in different versions depending on its application. Use AdhereVit ecoCORK for fixing the standard Secil Cork Boards which are then rendered or plastered. 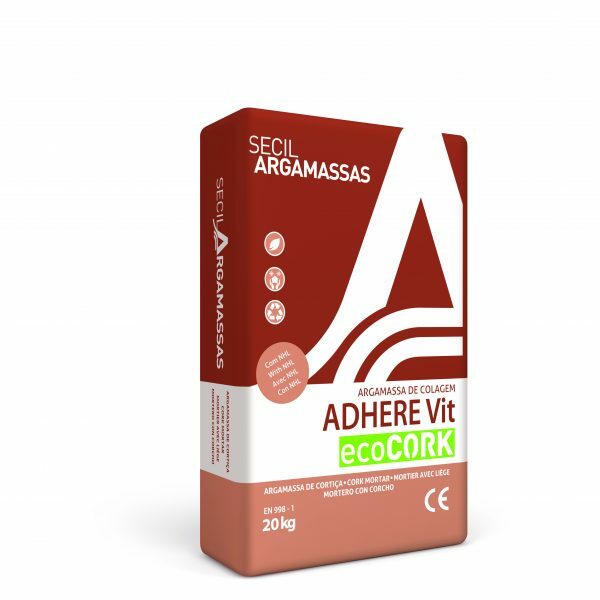 Use AdhereVit ecoCORK MD for fixing the Secil MD Façade Cork Boards. Supplied in 20 kg bags. Coverage is 6 m² when applied at an average thickness of 3 mm. Appropriate for the refurbishment of thermal insulation on painted or ceramic covered façades. When applied, it allows the mechanical fixing of external insulation systems directly over these types of substrates.